While pasta is cooking; cook sausage in 10-inch skillet over medium-heat, stirring occasionally, until no longer pink; drain. Mix pasta, sausage and remaining ingredients except cheese in ungreased 2 1/2-quart casserole. Cover and bake about 30 minutes or until hot and bubbly. Sprinkle with cheese. Bake uncovered about 5 minutes or until cheese is melted. Just for fun, make six smiley faces on the top with sliced pimiento-stuffed olives for the eyes and thin strips of green bell pepper for the smiles. 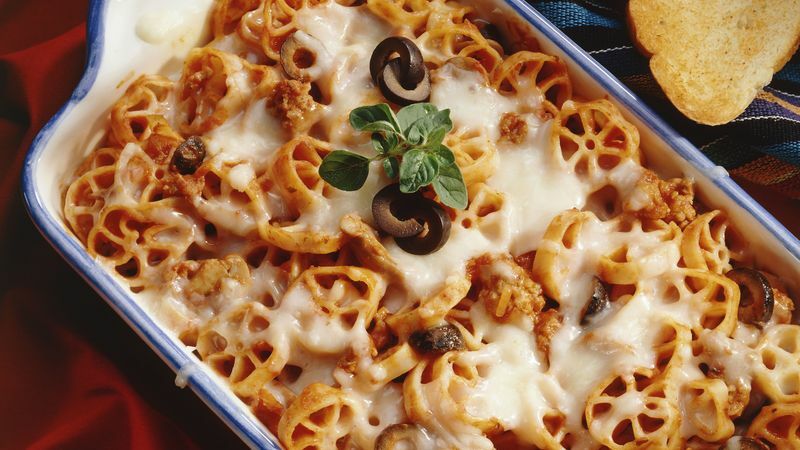 Dress up this casserole when you replace the wagon wheels with an equal amount of rotini, rotelle, penne or farfalle pasta. Hamburger pizza more your style? Use lean ground beef instead of Italian sausage.